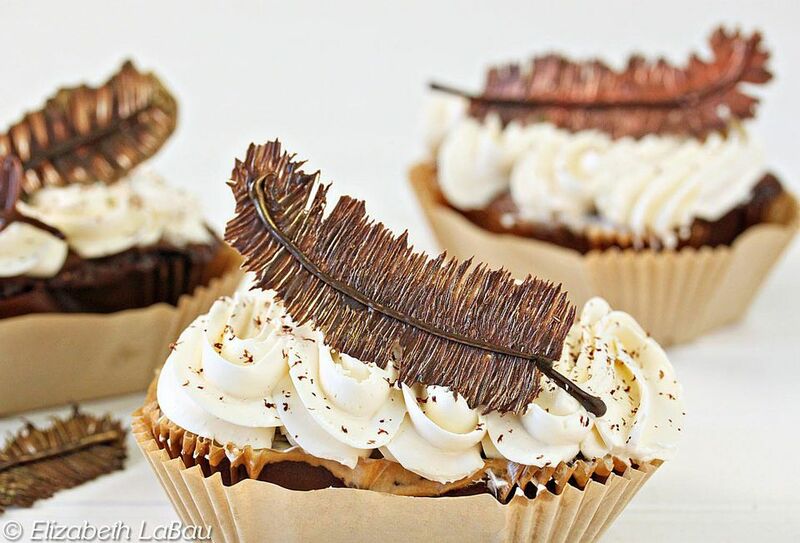 Chocolate Feathers are gorgeous decorative feathers made out of chocolate! These luminous, delicate feathers are the perfect decoration for any Thanksgiving or fall-themed dessert. The exact number of feathers you make from this recipe will depend a great deal on the size and thickness of the feathers, but 16 to 24 is a good estimate for mid-sized chocolate feathers. Cover a baking sheet with parchment paper. Place the chocolate candy coating in a microwave-safe bowl and microwave it in 30-second increments, stirring after every 30 seconds to avoid overheating. Stir until melted and smooth. Alternately, temper your chocolate using these instructions. Decide how large you want your feathers to be. Dip the stiff-bristled paintbrush in the melted coating and lightly sketch out the length of the feather, to give you a guideline. Dip the brush in the chocolate and start brushing out from the center of your guideline. Dip in the chocolate as often as necessary, using less pressure at the end of your strokes to create a feathered look. Once you've done the length of one side of the feather, repeat for the other side. One coat of chocolate will not be enough, so repeat this process several times, brushing over your earlier layers, until the chocolate is no longer translucent and is a thicker layer. To make them more realistic, while the chocolate is still wet, use a toothpick to scratch at the ends of the feathers to make them more ragged. You can also remove larger sections of feather to create the natural gaps that many feathers have. After you have made all of the feathers you need, transfer the remaining melted coating to a paper cone or plastic bag with a small hole snipped in the corner. Pipe a line of chocolate down the center of the feather, extending a bit from the end. Once all of the feathers have these lines, refrigerate the tray to set the chocolate. If you want to add a little glitz to your feathers, brush a bit of luster dust powder on the ends, or over the entire feather, once the chocolate is set. Gold, silver, and copper look especially good! These feathers are delicate, so they need to be handled with care! Remove them from the tray when they are fresh from the refrigerator—the cold chocolate will be more sturdy than room temperature chocolate. Transfer it to the dessert of your choice using the spatula.